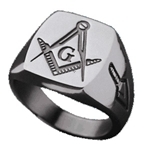 Stainless Steel Masonic Ring. Be sure of your size. If you are unsure about your ring size, please call us toll free at 800-637-4640. This ring really surprised me. The low price fooled me into thinking it was of low quality. Was I ever surprised! Thank you again Macoy for an affordable and very well made ring for daily wear.